It was a marvelous Christmas. Even though a health issue put an end to my tatting just before Thanksgiving I have not stopped thinking about tatting and now I think I am ready to start tatting again. I received the most wonderful tatting book for Christmas, a reprint edition from Germany containing two foundational works by Tina Frauberger. Her Handbuch Der Schiffchenspitze (1917) and her II Band Des Handbuches Der Schiffchenspitze (1921). I have wanted these books for a long time. Actually I wanted the first one and for a while thought the second one might just be a later printing of the first, but that is not the case. Though I do not read German using Babel Fish I feel confident in referring to this reprint as containing volumes one and two of the Manual of Tatting. Schiffchenspitze translates as Boat Point which refers to the shape of the shuttle and to lace, thus tatting). Geschichtliches is a history of tatting. Das Werkzeug or The Tool (primarily about the shuttle and I believe a hook for joining). Das Material obviously The Material which I believe mostly covering thread. Die Arbeitsart (Technik) on technique (forming the knot, joins, etc) this includes a few simple patterns including some using the onion ring. Meine Muster or My Samples contains the patterns. Next volume one has a section called Weiterbidung un Verwendung (Further training and use) while volume two has a section called Verwendung der Arbeit (Use of the work). Both Volumes end with a section titled Anhang: Das Waschen der Schiffchenspitze (Appendix: Washing the Tatting). The main section of the book is the patterns (Meine Muster). I have not noticed any repeated patterns in the two volumes. Both volumes have a few images that do not have patterns, but just a few. My copy came with a supplement (Nachtrag) giving the missing patterns at the beginning and towards the end of the first volume. I love the word for the diagrams Wortbild (word picture). There are many examples of what I would call edgings, insertions and motifs, but there are also a several doilies or mats. Many of the patterns are built from earlier patterns. An interesting historical suprise to me is that even though there are no patterns given there are illustrations of tatting with bead, this in 1917. Overall I find the patterns to be brilliant and especially beautiful. I must put Tina Frauberger amongst the top of my list of designers. The symbols and method of presenting the patterns is very different from anything I have seen elsewhere, and in some ways perhaps a little more intuitive, from my perspective. Dealing with an unfamiliar language and set of symbols, I had to deal with paragraphs indicating the use of an earlier pattern with additions or exceptions. I am planning my first project which is square mat (doily) built on what the designer calls Kronen (Crowns). 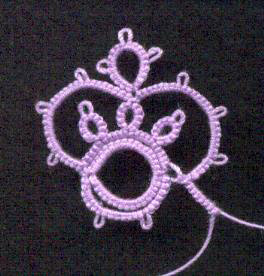 This is my first bit of tatting since before Thanksgiving and my first attempt at this motif. I think once I clean up that picot at the top of the onion ring I should have no trouble with the mat (doily). I found your page with a little help from Susanne, A.K.A. Dantatter. I, too, am a big fan of Tina Frauberger. I've only seen one pattern of hers (a snowflake I tatted and I have posted a pic at eTatters). I am interested in finding reprints of her books if possible. Where did you get such a find?